Here at Applied CCM, we love meshing. In our opinion there’s nothing better than a nice looking mesh, ready to use in our CFD analysis and give it the best chance of good convergence and the most accurate results possible. Applied CCM are the distributors for Pointwise in Australia and this is the first in a series of articles you will see from us in 2019 about meshes have been working on, either for fun or work. In this article we are showcasing a Pointwise mesh of a cricket bat. Why? Why not, I say, as a cricket tragic who also loves meshing and CFD. Yep that’s right – for our friends in USA – cricket (IMHO) is a more interesting version of baseball 😉 However the short forms of cricket these days are certainly heading in the direction of baseball, in the sense the hitting it out of the ground is now the main aim. It might be interesting to compare the drag coefficient of a baseball bat to a cricket bat – maybe later in 2019. I’m also keen to add a hotspot patch to the cricket bat mesh and perform a conjugate heat transfer calculation to see how long the hot takes to dissipate. I always wanted to know if the hotspot technology was capable of providing a false positive from a previous shots “snick”, or some other cause of a hot spot lingering on the bat edge. Imagine a quick series of balls from a short run up bowler. Could the previous snick or inadvertent touch of the bat cause a hot spot to linger and cause a batter to be dismissed? Maybe..maybe not. 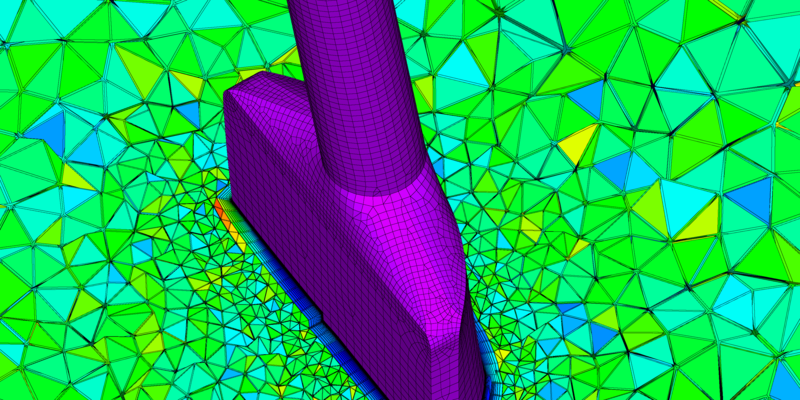 Pointwise is a third party meshing software that specialises in high quality meshes, and allows the user to create high quality meshes quickly and easily -with the ability to adjust the mesh very specifically. For example I was able to create this mesh quickly, and lift the surface mesh minimum included angle above 20 degrees by adjusting the surface mesh size and synchronise the cell spacing of edges. Thanks for reading, the next edition will be February 2019. Until then, happy meshing!